A Backpack, Boyfriend(? ), and Other Back-to-School Stuff | Are You Zhazha? As Nia and Nate made their way up the hill to the bus stop for the first day of school, my mind flashed back to last year. Sweet siblings. 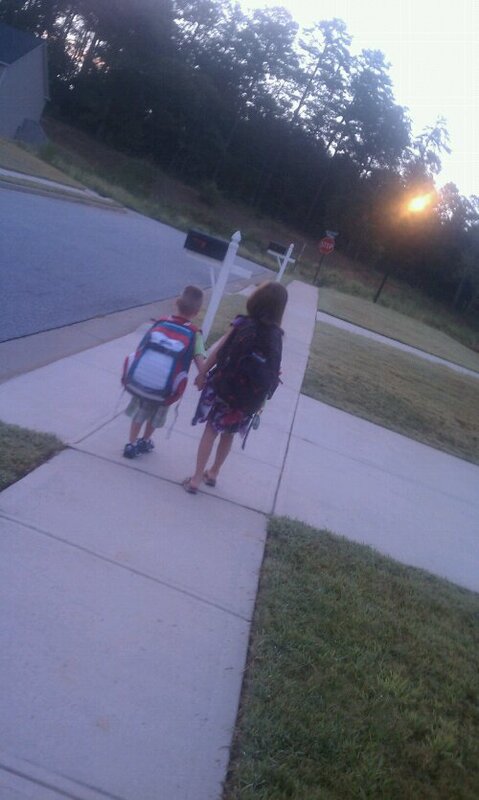 Kindergartener brother and Third Grader sister, holding hands as they made the walk together for the first time. It’s funny to think what a difference a school year can make. Right after I took the photo below, now First Grader Nate darted across the street, making sure he’d beat us all to the corner of the street. The kids were very excited to start this new year. Nate is digging the thought of getting bigger (and maybe getting to stay up later like Nia gets to sometimes). Nia, meanwhile, had been hoping for the teacher she got. When the letter arrived a week ago, she repeated over and over as Andrew opened it, “I hope it’s Mrs. Ballard. I hope it’s Mrs. Ballard.” Andrew tricked her and acted like it wasn’t but just as soon as he saw her face turn to disappointment, he gave her the announcement she wanted. Her face beamed. She then wanted to trick me like her daddy did to her. When I got home, she had a sad face and handed me the letter, “I really wanted Mrs. Ballard.” “Oh, I’m sorry Bean.” I looked at the letter and then looked up to her giggly, happy self. Apparently, she and Andrew rehearsed the trick. She was so happy to be headed back to school that she didn’t even let a little girl get her down at the bus stop when she turned Nia around to see her back and then sneered, “That’s last year’s bag!” Nia told me she replied, “So? Actually, I’ve had it for three years. It’s a really sturdy bag.” I am always amazed at how she manages to be so cool against cruelty. Even more impressive? Nia was playing with the little girl, along with Nate and another friend, in our front yard when I got home after work. I need to take lessons from Bean’s heart and attitude. Bean also had some discussions with a boy today about if she still had a “boyfriend.” Her response to this also cracks me up, “I don’t know. You should ask him. Why do you want to know anyways?” We gave her the talk that she doesn’t need to worry about any of that business. Just have friends. Something she insists is all she is with this other boy. “We’re just friends!” she says with animation and giggles. Sigh. I hope this year brings them fond memories and expands their brains enough to be able to play Apples to Apples with us without much explanation. After all, that’s why I had kids – breeding adorable, capable board game opponents is tough.